You are well aware that we from the Bank unions have been demanding enhancement in the ceiling on the quantum of Gratuity payable under the Gratuity Act to Employees and Officers in the Banks. Ever since the limit was enhanced to Rs.20 Iacs from 01-01-2016 for the Government Employees and Officers, there has been a genuine aspriation and expectation that the limit should be increased for the banking sector also. We learn that the amendment to the Act has been approved by the Cabinet also. 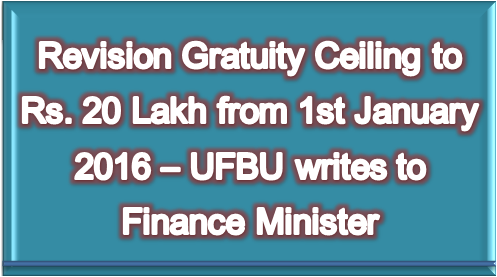 Since the Winter Session of the Parliament is scheduled to commence shortly, we Shall thank you to introduce the Bill in the ensuing Session of the Parliament for enhancing the Gratuity ceiling to Rs.20 lacs w.e.f. 01-01-2016 so that the same can be approved by the Parliament accordingly. We seek your special attention for doing the needful in this regard.